One of the most asked questions I received is “do you have any options for wet weather?”. My response: “of course we do!” and proceed to run through a list of the suitable options that we have available to provide shelter from the grey skies. Never underestimate Melbourne weather – we are known for having four seasons in one day after all! Having said this, be well prepared. Whether you’re having an outdoor wedding or have planned an outdoor photo shoot, you need to take into account that things may not go as originally planned. It’s important to have competent suppliers on board who will work with you and will provide you with sensible options and advice. When you have your heart set on a garden wedding, there are options available in the instance of wet weather. 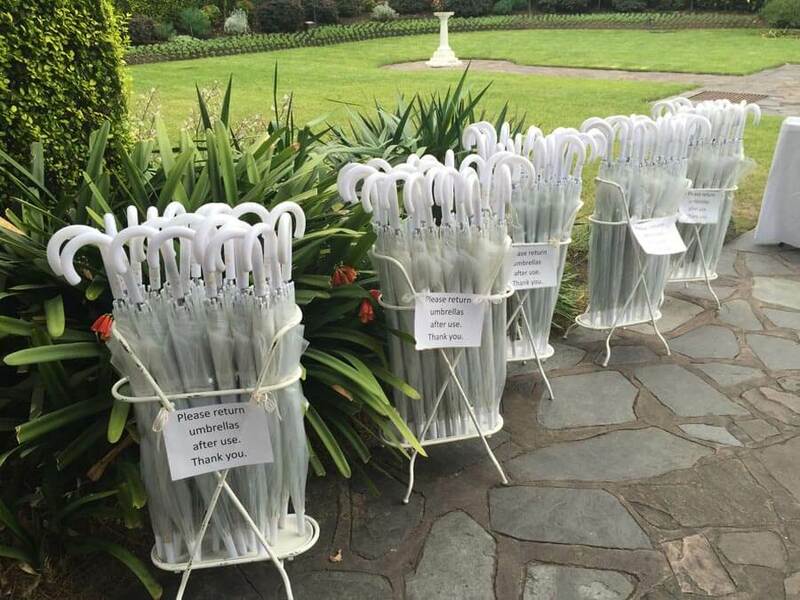 A recent wedding for over 100 guests at a beautiful, historic garden in the heart of Melbourne, successfully proceeded with large white garden umbrellas, pop-up marquees and clear hand-held umbrellas, providing adequate shelter from the elements. Always have a backup plan! This may be in the form of an indoor space at your current venue or a completely alternative indoor location. 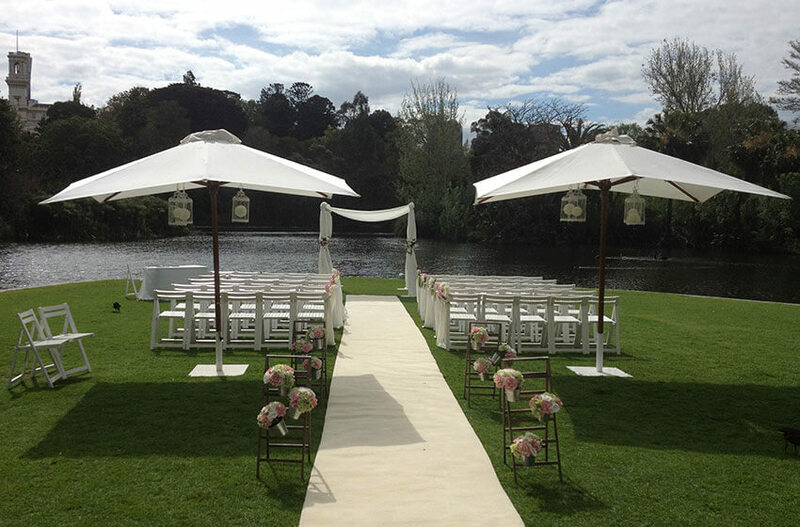 When booking your outdoor wedding, ask your venue consultant whether they have any wet weather contingency options available. You may be required to pay a small fee to secure this but it may turn out to be the best wedding day investment that you’ve made! A recent chuppah was booked at a beautiful St Kilda rooftop location. The weather in the weeks leading up to the wedding was unpredictable and on the day of the chuppah, a tough decision had to be made. We spoke with the bride and groom in the lead up to their special day to confirm setup instructions and noted that we are happy to setup the chuppah in any location of their choice. The wet weather contingency was the dance floor area, which is also the pre-dinner drinks location, of their wedding reception. The plan was simple. We were to setup the chuppah, they would get married, guests would enjoy a pre-dinner beverage, and we would then return to pack-down the chuppah once the guests were seated and served their entrees. The Weddings of Distinction team were efficient and discrete during the takedown and the process was practically unnoticeable. Think about how you are going to inform your guests of your wet weather plan in case you need to implement it. A good idea would be to include an insert with your invitations specifying the details of a wet weather contingency and a contact number or website link for updates. And most importantly, don’t panic! Speak with your venue and wedding suppliers, or feel free to get in touch with Weddings of Distinction, in the lead up to your special day and ask for advice. We’re all here to help!